Camon C7 is the latest of Tecno Smartphone, it was lunched just few weeks after Camon 9 was lunched. The both smartphone are the latest flagship of Tecno's product with both featuring 13MP front centered front facing selfie camera. These seems to be the first device featuring a center selfie and the both smartphones has hit the market and its currently on sales. However, the both device may have some cool similar features, but are not the same. They posses some difference that differentiates the two of them. But, lets see the similarities first. They both have same camera quality, featuring 13MP both front and back with the front centered, in terms of the design, they look similar, at the back is 13MP camera with flash and toward the bottom (still at the back) is the speaker of the device. While at the top is an earpiece port. And also, the storage capacity of the two device are same with 16GB internal storage and has an expansion slot that supports MicroSD Card up to 128GB. The Ram size is still the same, 2GB Ram size, both running on the latest Android 6.0 Marshmallow Operating System. In terms of connectivity, they both feature a wireless connection via Wifi, Bluetooth, Hotspot, GPS and a cable connection via a MicroUSB cable. While in terms of network they both features 2G and 3G network and supports dual SIM Card. The both does not support fast battery charging technology. They are both equipped with latest eyeball identifying technology (eye scanner), these means that you can unlock the device with your eye ball, they also support Tecno T-Band which is capable of monitoring sleep pattern, steps, and also alert the owner on calls and massages. Similarly, as they have similarities they surely have difference. They can't be completely the same in specs and in fetaures even in price. First, in terms of display. The Camon C7 features a display size of 5.0-Inch and a dimension of 142.1 x 71 x 5.4 mm while the Camon C9 features a 5.5-Inch and a dimension of 153 x 76.4 x 10.35 mm which clearly shows that C9 is bigger in display than the C7. In terms of Network, the C7 features a highest network of 3G meaning that it does not support the 4G LTE network, but the C9 has 4G network support. The presence of the 4G in the C9 show that the C9 is more faster in terms of speed when browsing with a download speed of 300Mbps and an upload speed of 50Mbps. In terms of battery capacity, the C7 has a battery capacity of 2500 while the C9 is powered with a 3000mAh battery (both removable). The capacity difference shows that the C9 has a more long lasting battery life than the C7. 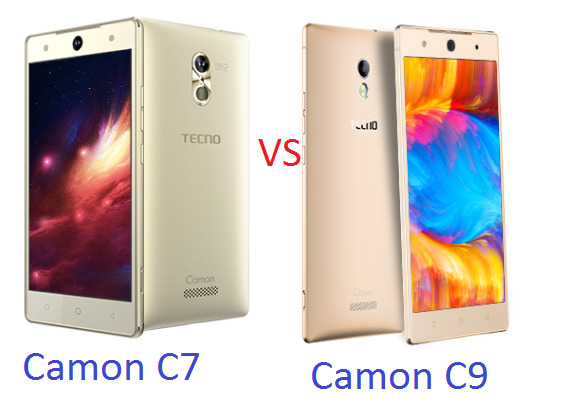 From the comparison, it clearly show that the Camon C9 is more powerful than Camon C7, Also, the C9 is more expensive than the C7. We believe that the C7 was produces to be an option for people who want a powerful selfie smartphone but may not be able to afford the C9 then the C7 would be an option.